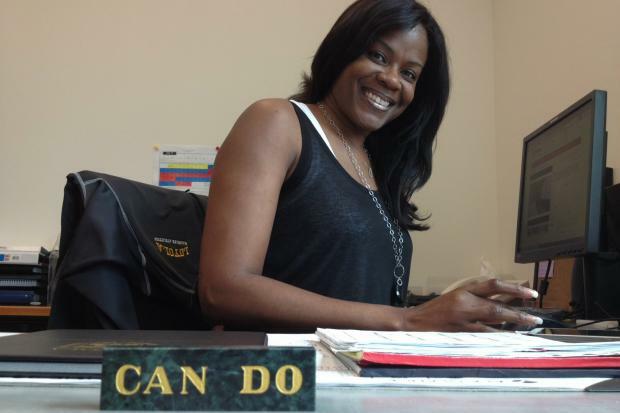 ROGERS PARK — Sheryl Swoopes, arguably the greatest women's basketball player ever, is more than comfortable in her own skin. She was married to a man, had a lengthy relationship with a woman and is currently engaged to another man. And she has no problem talking about it. "I'm totally OK with who I am, and I'm OK sharing my story," said Swoopes, a former college and pro basketball superstar who was named Loyola University Chicago's head women's hoops coach in April despite having no previous coaching experience. "I've just learned to live my life for me and not for anybody else. There's only one person who will judge me, and that's God," Swoopes, 42, said Friday. USA's Sheryl Swoopes (right) jumps to take control of the ball with Leidis Oquendo Valdes of Cuba during their FIBA World Championship for Women in 2006. Swoopes, arguably one of the greatest women's basketball players ever, is the new head coach at Loyola University. Swoopes is living in a two-bedroom dorm room at Loyola's Baumhart Hall downtown with her fiance, trucking company owner Chris Unclesho. It's the first time Swoopes has resided in a dorm since her days at South Plains Junior College, before she became a superstar at Texas Tech and then with the Women's National Basketball Association. "I've been living out of a suitcase for a month, and all of our stuff is in Lake Zurich in storage," said Swoopes, a three-time Olympic gold medalist and three-time WNBA MVP. "It's not an ideal situation obviously, but at least I'm not living on the street." Swoopes originally applied for the assistant coaching position at Loyola after then-head coach Eric Simpson resigned. But Loyola athletic director Dr. M. Grace Calhoun had bigger plans in mind for Swoopes, considered by some to be the Michael Jordan of women's hoops. "I'm in a business where you have to take calculated risks, but I never looked at Sheryl as a risk," Calhoun said Monday. "Her strong points, her background, her knowledge of the game, her passion for the game and her passion to be a mentor — she just has so much upside." Though local Catholic leaders consider homosexuality "morally wrong," at Loyola, Swoopes said officials did not ask her about her past long-term relationship with a woman, Alisa "Scottie" Scott. "If it had been an issue with any school, then I don't need to be there anyway," Swoopes said. Calhoun said she was well aware of Swoopes past relationship, and looked at it as a "positive." "What's unfair about her is there's so much stuff in the media about her personal life," Calhoun said. "I've always felt that you had to put that aside when looking at someone's ability to do the job." "Her rich life experiences are going to do nothing but help her be a mentor because she's been open and honest about everything." Scott was an assistant coach on the WNBA team Swoopes once played for, the Houston Comets. When Swoopes went public with their relationship in 2005, she told the New York Times that she had tired of "living a lie" and that she was "tired of having to pretend to be somebody I am not." She told the Times that the relationship started as a platonic friendship and "I never really meant for it to happen. ... After a while, it got to a point, 'I am not going to try to fight this anymore.'" In 2011, Swoopes, then playing for the Tulsa Shock, said she was engaged to Unclesho. In an interview with DNAinfo.com Chicago, Swoopes explained: "My previous relationship, that’s who I was 10 years ago. "I don’t think a person can help who they fall in love with. The person I fell in love with at that time happened to be another woman. That’s how I looked at it," she said. Shewired.com, a lesbian news website, said some in the LGBT community felt betrayed by Swoopes' announcement while some "homophobes" thought her situation proved that homosexuality can be "cured." Swoopes says now that "it bothers me sometimes that people put so much emphasis on it." Swoopes' focus is simply on basketball — the Ramblers' athletic program is off the radar, even though the former Horizon League school is joining the higher-profile Missouri Valley Conference this coming season. "It's the perfect opportunity to learn the game from a coaching perspective and not really be in the spotlight," Swoopes said. "[Loyola] hasn't been known for our basketball program or for our athletics in general. This school is known for its academics. For me to be here and get a couple of years under my belt, I don't think I could have asked for a better situation. "I'm a risk taker. Without taking risks, you never know who you can be, what you can become. Every day I wake up, I know this is where I'm supposed to be." Swoopes originally met Unclesho more than 10 years ago, when she played for the Comets in Houston and he owned Club Sempers in that city. "Every athlete and celebrity that came into town went to his club," Swoopes said. "We were friends at first, and I never looked at him like someday I want to be with this guy. "But there was something interesting about our connection, even though we had never dated." Swoopes said she and Unclesho drifted apart for several years, but they reunited in 2010 when she returned to Houston after a brief playing stint in Greece. Invited to his house for a barbecue, "I must have put on four different outfits before I went there," she recalled. "He came outside, and immediately when he hugged me, my heart stopped, and I asked myself 'What am I feeling right now?' He said to me, 'I'm not going to let you get away this time.' The next day, I actually moved in with him. It happened kind of fast," she said. Unclesho proposed to Swoopes on March 25, 2011, her 40th birthday. The couple haven't set a wedding date. "We were possibly going to do it this summer, but then this job happened," she said. The campus reaction to Swoopes' arrival has ranged from "shock" to "excitement." One of the school's most esteemed figures, Sister Jean Schmidt, said the hire was "great." "Yes, Sheryl Swoopes has my blessing," said Schmidt, the school's last nun and its longtime men's basketball team chaplain. "Sheryl will be a great Rambler because she believes in the Jesuit principles, which we live both on and off the court." Several current and former students said they were pleased that Swoopes' sexual history did not appear to affect the Catholic university's decision to hire her. "Being here for four years, the school is more open-minded than it gets credit for," said Travis Olson, a recent graduate who was president of Advocate, a registered LGBT student organization. "It's very encouraging that they hired [Swoopes]. I think that the university takes its social justice mission very seriously. The staff and the administration that are there see LGBT issues as part of that social justice mission," Olson said. Brendan Bond, a recent graduate and former sports editor of the student newspaper, the Loyola Phoenix, said the school is "very progressive and open to the gay community." The Phoenix's co-sports editor for next school year, Bridget Murphy, said Loyola's Jesuit philosophies "tend to be more liberal." Murphy added that she thinks Loyola will use Swoopes' hiring to dramatically boost the publicity for the women's hoops program. "Even those who don't follow Loyola sports were talking to me about how excited they were to have Sheryl Swoopes on campus," Murphy said. Swoopes' son from a previous marriage, 16-year-old Jordan Jackson, is set to move in with the couple over the summer and may stay with them when they find a permanent place, likely near Loyola's Rogers Park campus. Jackson is a phenom in his own right, in basketball and high jump, where he recently set a school record at St. Pius X High School in Houston. Swoopes said her biggest goal in the next few weeks was to find a veteran assistant to teach her the coaching ropes. In the middle of recruiting trips and bonding with her players, Swoopes also is becoming a bigger part of the Loyola campus. Like all new school hires, she's taking her "Loyola 101" orientation classes. "Everything I've gone through in my life was all part of my journey to get me where I am right now," Swoopes said.